To Cite: Salimi G, Mohamaddi M, Mehrvarz M , Hashemi K. The Role of Technology Acceptance in Predicting Knowledge Sharing Among Students of Shiraz University of Medical Sciences, Strides Dev Med Educ. Online ahead of Print ; 15(1):e87036. doi: 10.5812/sdme.87036. Background: Today knowledge and information sharing by means of new technologies among university students and faculty members is important. Therefore, it is necessary to identify factors which influence knowledge sharing among university students. Objectives: The main purpose of the present study was to examine the role of technology acceptance in improving knowledge sharing among students of Shiraz University of Medical Sciences, Shiraz, Iran. Methods: In this applied research, a descriptive-analytic cross-sectional study was used. The study sample consisted of 228 medical students from Shiraz University of Medical Sciences. The data collection tools included two questionnaires, i.e., technology acceptance (Toe, 2011) and knowledge sharing (Van den Hoof & Van Weenen, 2004) questionnaires. The validity of these scales in terms of form and content was examined by experts in the field, and their reliability was confirmed by measuring Cronbach’s alpha coefficients. The reliability of technology acceptance and knowledge sharing questionnaires was 0.83 and 0.72, respectively. After confirming the validity and reliability of the questionnaires, they were distributed among the participants. Finally, the collected data were analyzed using one-sample t-test and Pearson’s correlation coefficient test in SPSS and structural equation modeling (SEM) in Lisrel 8.8. Results: The results of one-sample t-test showed that the levels of technology acceptance and knowledge sharing were higher than the acceptable level among medical students. In addition, the results of Pearson’s correlation test indicated a significant positive relationship between technology acceptance (and its components) and knowledge sharing. In addition, SEM showed that technology acceptance is a significant positive predictor of knowledge sharing among students. Among different components of technology acceptance, only perceived usefulness (PU) and facilitating conditions (FC) were significant predictors of knowledge collecting (P = 0.37 and 0.28, respectively). Nevertheless, other components of technology acceptance could not predict different types of knowledge sharing. Conclusions: The present results showed that PU and FC could predict the knowledge sharing of students more than other components. To improve knowledge sharing in the context of higher medical education, different aspects of technology acceptance need to be evaluated and expanded; accordingly, establishment of new educational policies is necessary. Today, universities and higher education institutions play an important role in promoting knowledge generation and sharing among students (1). Knowledge sharing, as one of the knowledge management processes, is considered a challenging and important concept in higher education organizations and can be introduced as the most important organizational resource (2). Previous studies have reported a significant positive relationship between knowledge sharing and organizational health of employees working in public universities (3). Researchers and academicians have recognized the process of knowledge and information sharing in higher education institutions (4). Therefore, it is necessary to prepare the ground for students to effectively share their knowledge, promote their collaborative learning skills, produce new knowledge, and manage, apply, and share their knowledge (5). Chin Wei et al. (6) found that structured group activities, collaboration-centered learning, and academic institutions can facilitate the process of knowledge sharing among students. Previous studies have shown that active and willing participation of students in knowledge sharing is the main factor in effective and meaningful learning (7). In addition, this type of involvement can facilitate academic learning and improve the personal development of students (8). For this reason, some higher education institutions in developed countries receive regular financial budgets for activities concerning knowledge management in universities (2). Considering the significance of this phenomenon, it is necessary to facilitate knowledge sharing among students, especially among medical students whose learning is mostly based on experience, collaboration, and group interaction. In the knowledge management literature, knowledge sharing has been conceptualized in different ways. Some describe knowledge sharing as active participation in the production of information (9), some define it as shared work experiences of employees in organizations, teams, and classes (10), and some highlight the relationship between different types of knowledge (e.g., intuitive and technical knowledge) (2). Knowledge sharing can help people transfer their knowledge to others so that they can use it to improve their performance (11). Considering the growing significance of knowledge sharing, it is necessary to determine the requirements for success. Most researchers believe that knowledge sharing takes place when the members of a community are willing to know about the information and skills of others (2). Therefore, internal and external motivators, encouraging people to share their knowledge, should be recognized. Moreover, detailed analysis of the following phenomena is essential: Knowledge sharing barriers; external benefits including economic rewards, promotion, managerial support systems, social rewards with social acclaim, organizational structure, leadership, confidence, networking, and communication (9, 11-13); and internal benefits including satisfaction, self-confidence, high efficacy, learning from experience, and enjoyment (10-13). Overall, these factors can improve the process of knowledge sharing. As mentioned earlier, to promote knowledge and information sharing at universities and higher education institutions, besides paying adequate attention to the benefits of knowledge, one needs to consider the barriers to knowledge generation. These barriers can be divided into three groups: Personal, organizational, and technological (14). According to previous studies, some of the obstacles in the process of knowledge sharing include: (I) lack of self-confidence, egoism, and special social conditions (15); (II) time-related pressure, superficial relationships, and scientific competition (13, 16); and (III) also insufficient interaction and the students fears of their educational performance can be the obstacles in the process of knowledge sharing. Unhealthy competition among members of a group can be decreased when there is trust, group work, and a positive outlook towards knowledge sharing (17). It is clear that the positive or negative attitude of people affects the process of knowledge sharing (2, 18). In other words, there is a relationship between people’s attitude towards knowledge sharing and performance of knowledge sharing (19, 20). Therefore, it is necessary to find ways through which a positive attitude towards knowledge sharing can be encouraged among university students. Previous studies have shown that students’ realization of the fact that use of different technologies is convenient can directly influence their motivation, attitude, goals, and expectations of the managerial system. In fact, information technology is one of the most important organizational structures, which can affect knowledge sharing. Application of information technology is a major component of the learning process (21). Therefore, implementation of a program for effective knowledge sharing requires the expanded application of modern information technologies. These technologies can decrease temporal and spatial limitations, improve knowledge sharing, and facilitate access to information (2). Although several studies suggest that communication and information technologies cannot guarantee the success of knowledge sharing (11), some argue that there are various models and methods to describe factors affecting technology acceptance. The model used in the present study was suggested by Teo (22), which is a combination of three models, i.e., technology acceptance model (TAM), theory of planned behavior (TPB), and user acceptance of information technology (UTAUT). Most researchers believe that TAM can predict technology acceptance by users. According to this model, usefulness and perceived ease of use are the determining factors in technology acceptance. A few years later, TPB (23) was introduced as a model for explaining technology acceptance. According to this theory, attitudes, subjective norms (SN), and behavioral control are the key determining factors in people’s goals and behaviors. On the other hand, the UTAUT theory asserts that the user’s intentions of using information systems are influenced by four factors, i.e., performance expectancy, efforts expectancy, social influence, and facilitating conditions (FC) (24). I) To what extent are technology acceptance and knowledge sharing practiced by the medical students of Shiraz University of Medical Sciences? II) Is there a significant relationship between technology acceptance and knowledge sharing among students? III) Can the components of technology acceptance significantly predict different types of knowledge sharing among students? Since the aim of the present study was to examine the role of technology acceptance in predicting knowledge-sharing behaviors among medical students of Shiraz University of Medical Sciences, a descriptive correlational design was adopted. The study population consisted of all medical students of Shiraz University of Medical Sciences (n, 950) in 2017. Based on the Morgan’s Table, a total of 274 students were recruited in this study. The researcher-made questionnaires were distributed among the participants in January 2017; the process of data collection was completed in March 2017. Out of 274 students, 228 completed the questionnaires; in other words, almost 83% of the distributed questionnaires were completed. This study was approved by the Ethics Committee of Shiraz University of Medical Sciences. In addition, explanations were given to the participants regarding the study objectives, collection of data, and confidentiality of their personal information. The data collection tools included the technology acceptance questionnaire (22), which addressed six major issues, i.e., SN, FC, perceived ease of use (PEU), perceived usefulness (PU), attitude towards use (ATU), and behavioral intention to use (BIU) (20 items). This scale was used by Mehdipour et al. (25), Kahrizsangi et al. (26), and Ajam et al. (27), who reported Cronbach’s alpha coefficients of 0.80, 0.80, and 0.88, respectively. This scale has been also approved by Venkatesh and Davis (28). The knowledge sharing questionnaire included two aspects, namely, knowledge donating and knowledge collecting (seven items). The validity of the questionnaires in terms of form and content was assessed by experts, and their reliability was confirmed by measuring Cronbach’s alpha coefficients. The reliability of the technology acceptance and knowledge sharing questionnaires was 0.83 and 0.72, respectively. Both questionnaires applied a five-point Likert scale (1, strongly disagree; 2, disagree; 3, neutral; 4, agree; 5, strongly agree). The questions were intended to evaluate technology acceptance and knowledge sharing. To answer the research questions, we used one-sample t-test and Pearson’s correlation coefficient test in SPSS version 23, as well as structural equation modeling (SEM) in Lisrel version 8.8. 4.1. To What Extent Are Technology Acceptance and Knowledge Sharing Practiced by the Participants? Table 1 shows the mean and standard deviation of different dimensions of technology acceptance among university students, i.e., FC, SN, PEU, PU, BIU, and ATU. The collected data on technology acceptance show that PU (4.03) and SN (3.43) have the highest and lowest mean values, respectively. In the mean comparison of technology acceptance components and acceptable standards (Q2), one-sample t-test showed that the means of all technology acceptance components were higher than the acceptable standards. It can be concluded that the level of technology acceptance among students was higher than the acceptable standard (Table 1). Abbreviations: ATU, attitude towards use; BIU, behavioral intention to use; FC, facilitating conditions; PEU, perceived ease of use; PU, perceived usefulness; Q2, acceptable level; Q3, desirable level; SN, subjective norm. However, in the mean comparison of technology acceptance components and desirable standards (Q3), one-sample t-test showed that only the mean of PU was higher than the desirable level (Table 1). The mean and standard deviation of knowledge donating and knowledge collecting were then compared with the acceptable (Q2) and desirable (Q3) standards. In the mean comparison of technology acceptance components and acceptable standards (Q2), one-sample t-test showed that the means of both knowledge donating and knowledge collecting were higher than the acceptable level. However, in comparison with the desirable standards (Q3), one-sample t-test showed that the means of both knowledge donating and knowledge collecting were lower than the desirable level (Table 1). 4.2. Is There a Significant Relationship Between Technology Acceptance and Knowledge Sharing Among the Students? In the inferential analysis, normal distribution of data was confirmed using nonparametric Kolmogorov-Smirnov test. Then, Pearson’s correlation coefficient test was used to examine the relationship between technology acceptance and knowledge sharing. As presented in Table 2, ATU and BIU with a correlation coefficient of 0.60, BIU and PU with a correlation coefficient of 0.42, and PEU and ATU with a correlation coefficient of 0.42 had the most significant correlations. Subjective norm (SN) had the lowest correlation coefficient with other components. In general, there was a significant positive relationship between technology acceptance and knowledge sharing at an error level of 0.05 (P < 0.05, correlation coefficient 0.32). Abbreviations: ATU, attitude towards use; BIU, behavioral intention to use; FC, facilitating conditions; PEU, perceived ease of use; PU, perceived usefulness; SN, subjective norm. a Correlation is significant at 0.01 (two-tailed). b Correlation is significant at 0.05 (two-tailed). 4.3. Can the Components of Technology Acceptance Significantly Predict Different Types of Knowledge Sharing Among Students? To test this hypothesis of the study, we used the SEM model. Models 1 and 2 are structural models in the standard estimation mode. According to Figure 1, technology acceptance among the students of Shiraz University of Medical Sciences was a significant positive predictor of knowledge sharing (β = 0.55). In terms of technology acceptance, PU (load factor = 0.50) could predict knowledge sharing more than other components. In terms of knowledge sharing, knowledge donating (load factor = 0.57) could predict technology acceptance more than knowledge collecting. 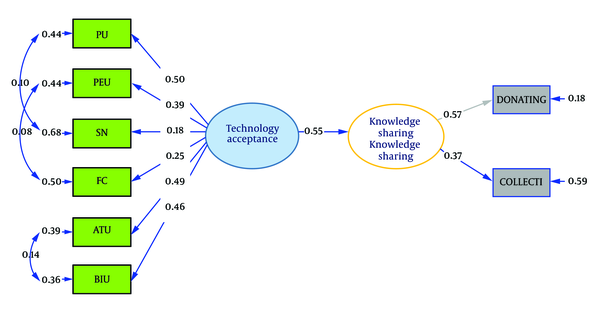 In addition, Figure 2 is a structural model for the effect of technology acceptance on different types of knowledge sharing. Among various components of technology acceptance, PC and PU, with the respective significance levels of 37 and 28, were described as significant predictors of knowledge collecting rather than knowledge sharing. Other components of technology acceptance could not predict or determine different types of knowledge sharing. To calculate the fitness of Figures 1 and 2, Lisrel 8.8 was used. According to expert opinion, v2/df should be lower than three in an efficient model (29). The goodness-of-fit index (GFI) should be close to 0.90 (30, 31), and adjusted GFI (AGFI) should be above 0.80 (32). In addition, the comparative fit index (CFI) should be above 0.9 in a normal fitness analysis (30, 32, 33), and the root mean square error of approximation (RMESA) should be lower than 0.07 (32, 34). Marsh et al. noted that an efficient model should have the following features: RMESA = 0.8; CFI = 0.95; Tucker-Lewis index (TLI) = 0.95; and standardized root mean square residual (SRMR) = 0.10 (35). Lisrel 8.8 was used to calculate the fitness of Figures 1 and 2. According to Table 3, given the high values of CFI, incremental fit index (IFI), GFI, non-normed fit index (NNFI), NFI, RMSEA, and relative fit index (RFI), the fitness of the model was acceptable. To answer the research question regarding the role of technology acceptance in knowledge sharing, we discussed the theoretical underpinnings of these concepts. Then, an analysis was presented in order to determine the factors, which could better predict technology acceptance and knowledge sharing among students. We determined different aspects of technology and communication acceptance, which had greater effects on knowledge sharing among university students, in order to prepare the ground for improving this process. It was found that only PU and FC could significantly predict knowledge collecting, while other components of technology acceptance could not predict knowledge sharing; therefore, PU had a stronger impact in comparison with other factors. PU refers to a person’s perception about the efficacy of a particular form of technology in knowledge sharing. When technologies improve the performance of users, they are perceived to be useful and are therefore used more frequently (36). University students should recognize that they cannot only rely on their own information sources and need to share knowledge with others to save time and improve their learning; therefore, knowledge reception and knowledge sharing should be facilitated. In addition to PU, FC can also have immense effects on knowledge sharing among students. FC is the degree to which an individual believes that the infrastructure supports the use of a special form of information technology. Overall, when application of a form of technology requires less effort, it will be more widely applied. Therefore, use of up-to-date and easily accessible information technologies should be promoted among students (36). Organizational factors, social factors, computer features (e.g., hardware and software), training, and group work can all influence a person’s perception about the usefulness and easy application of information technologies (37). Chin Wei et al. (6) showed that scientific centers could improve knowledge sharing among university students by concentrating on structured group activities and cooperative learning. In fact, easy communication and sharing leads to an increase in collaborative learning among students and promotes the application of acquired knowledge. Technologies used in this area encourage a sense of cooperation and knowledge sharing and make the process of learning interesting. Accordingly, selection of efficient technologies in line with the goals of university students can be highly useful in the process of knowledge sharing (37). In a previous study on the applicability of non-American cultural models and the factors influencing information technology acceptance, it was found that personal attitudes, mental perceptions about the ease of use, and usefulness are the most important factors in the acceptance of information technologies (38). Davis et al. (37) quoted that PU has direct effects on technology acceptance, while it has less significant effects on the acceptance of technology. In addition to PU and FC, the model of information technology acceptance has other dimensions, including PEU, BIU, ATU, and SN, which do not affect the process of knowledge sharing. Accordingly, certain training courses should be designed to familiarize educationalists and students with different aspects of knowledge sharing and improve the attitudes and perceptions of students towards technology acceptance and knowledge sharing. According to various studies, there is a significant positive relationship between information technology and knowledge sharing (2, 9, 11, 21, 29, 39, 40). While some previous studies have suggested that information and communication technologies do not guarantee knowledge sharing (9, 11, 41), reported that information technology, networking, and trust have significant positive effects on knowledge transfer and knowledge sharing. Advancements in information technologies have led to the emergence of new forms of knowledge sharing tools including: Knowledge resources; online networks for direct knowledge sharing; video conferences; peer-to-peer technologies; social networks for indirect knowledge sharing (11); and electronic tools including Emails, online messages, video chats, and online social networks, as well as other electronic tools such as laptops and smart phones (9). Overall, use of electronic tools in virtual networks can foster knowledge sharing and create a community with shared interests, ideas, and wishes directed at solving problems and communication about public issues (40). It can be claimed that knowledge sharing is not only a goal, but also a means to facilitate organizational processes. The outcomes of knowledge sharing include formation of new knowledge, innovation, and improvement of organizational performance (2). Some studies have suggested that economic success in the future would depend on the ways in which organizations acquire, distribute, and use knowledge. Generally, knowledge is very important for both private and governmental organizations, especially in learning centers such as universities (2). Knowledge management has become an important strategic resource for creating competitive advantages in organizations (1). Knowledge sharing at universities and higher education centers can improve motivation and strengthen team work among students. This should be especially encouraged in departments of medical sciences, as an important part of medical learning is based on cooperation and knowledge sharing. In fact, modern universities are expected to promote optimal knowledge sharing. The positive attitude of students towards new technologies and their application can also encourage knowledge-sharing behaviors. However, to achieve this goal, the quality of technologies should be improved, and students’ attitudes and behaviors should be corrected so that they allocate more time to these technologies to promote the process of knowledge sharing. The main goal of our study was to determine the effect of technology acceptance on predicting knowledge sharing among students of medical sciences at Shiraz University. The results of one-sample t-test showed that university students tended to use information technologies for knowledge transfer and knowledge sharing. However, according to one-sample t-test university students believed that using technologies for information and knowledge sharing is highly useful. Moreover, the results of Pearson’s correlation test showed a significant positive relationship between technology acceptance (and its dimensions) and knowledge sharing (P < 0.05). In addition, the SEM results showed that technology acceptance is a significant positive predictor of knowledge sharing among students. Finally, it should be noted that this study was limited to one single university of medical sciences, and therefore, it is difficult to generalize the results. Further comprehensive research is needed on knowledge-sharing behaviors and their effects in institutions of higher medical education. We would like to thank all the participants at Shiraz University of Medical Sciences for their sincere cooperation. Authors' Contribution: Ghasem Salimi was responsible for the design of the study, interpretation of the data and critical revision of the manuscript; Mehdi Mohamaddi contributed to analysis and interpretation of the data and drafting of manuscript; Mahboubeh Mehrvarz, contributed to the collection of data, analysis and interpretation of the data and drafting of manuscript; Kamal Hashemi contributed to the collection of data. Finally, all authors read and approved the final manuscript. Conflict of Interests: The authors declare no conflict of interests regarding this study. Ethical Considerations: The current study was approved by the Ethics Committee of Shiraz University. The participants were informed about the study goals and involuntary complete the questioners. Funding/Support: This research was not supported by any person or organization. 1. Koushazade SA, Omidianpoor S, Zohurian M. The impact of organizational factors on the effectiveness of knowledge management among nurses. Int J Hospital Res. 2015;4(3):129-35. 2. Sohail MS, Daud S. Knowledge sharing in higher education institutions: Perspectives from Malaysia. Vine. 2009;39(2):125-42. 3. Sa’adati Azar A, Nasiri MJ, Nasiri S. Knowledge sharing: The key factors in the success of knowledge management system in the organizational health of the employees working in the public universities of Tehran. Manag Issue Healthcare Sys. 2016;2:34-42. doi: 10.19259/mihs.2016.01.04. 4. Shaheen M, Panchapakesan Kumari C. Role of knowledge sharing in the learning process. Literacy Inf Comput Educ J. 2013;Special 2(1):1292-8. doi: 10.20533/licej.2040.2589.2013.0171. 5. Liao C, Wang HY, Chuang SH, Shih ML, Liu CC. Enhancing knowledge management for RD innovation and firm performance: An integrative view. Afr J Bus Manag. 2010;4(14):3026-38. 6. Chin Wei C, Siong Choy C, Geok Chew G, Yee Yen Y. Knowledge sharing patterns of undergraduate students. Libr Rev. 2012;61(5):327-44. doi: 10.1108/00242531211280469. 7. Kim D. The effects of knowledge sharing on program performance: Influences on CPS program performance [dissertation]. Virginia Tech; 2011. 8. Chong CW, Teh PL, Tan BC. Knowledge sharing among Malaysian universities’ students: Do personality traits, class room and technological factors matter? Educ Stud. 2013;40(1):1-25. doi: 10.1080/03055698.2013.825577. 9. Meddour H, Abdul Majid AM, Yusoff RZ. The impact of information technology and networks on knowledge transfer and sharing: The mediating role of trust. World J Manag Behav Stud. 2016;4(1):31-40. doi: 10.5829/idosi.wjmbs.2016.4.1.1326. 10. Zhang X, Chen Z, Vogel D, Yuan M, Guo C. Knowledge-sharing reward dynamics in knowledge management systems: Game theory-based empirical validation. Hum Factor Ergon Man. 2010;20(2):103-22. doi: 10.1002/hfm.20203. 11. Zhang X, de Pablos PO, Xu Q. Culture effects on the knowledge sharing in multi-national virtual classes: A mixed method. Comput Hum Behav. 2014;31:491-8. doi: 10.1016/j.chb.2013.04.021. 12. Al-Hawamdeh S. Knowledge management: Cultivating knowledge professionals. Oxford: Chandos Pub; 2003. doi: 10.1533/9781780631936. 13. Razmerita L, Kirchner K, Nielsen P. What factors influence knowledge sharing in organizations? A social dilemma perspective of social media communication. J Knowl Manag. 2016;20(6):1225-46. doi: 10.1108/jkm-03-2016-0112. 14. Riege A. Three‐dozen knowledge‐sharing barriers managers must consider. J Knowl Manag. 2005;9(3):18-35. doi: 10.1108/13673270510602746. 15. Ong HB, Yeap PF, Tan SH, Chong LL. Factors influencing knowledge sharing among undergraduate students. Ind High Educ. 2011;25(2):133-40. doi: 10.5367/ihe.2011.0035. 16. Hussein ARH, Nassuora AB. Jordanian student's attitudes and perceptions towards knowledge sharing in institutions of higher education. Int J Acad Res. 2011;3(4):401-5. 17. Majid S, Chitra PK. Role of knowledge sharing in the learning process. Literacy Inf Comput Educ J. 2013;Special 2(1):1292-8. doi: 10.20533/licej.2040.2589.2013.0171. 18. Fullwood R, Rowley J, Delbridge R. Knowledge sharing amongst academics in UK universities. J Knowl Manag. 2013;17(1):123-36. doi: 10.1108/13673271311300831. 19. van den Hooff B, Schouten AP, Simonovski S. What one feels and what one knows: The influence of emotions on attitudes and intentions towards knowledge sharing. J Knowl Manag. 2012;16(1):148-58. doi: 10.1108/13673271211198990. 20. Papadopoulos T, Stamati T, Nopparuch P. Exploring the determinants of knowledge sharing via employee weblogs. Int J Inform Manage. 2013;33(1):133-46. doi: 10.1016/j.ijinfomgt.2012.08.002. 21. Siang JJ, Santoso HB. Students'perspective of learning management system: An empirical evidence of technology acceptance model in emerging countries. Res World. 2015;6(2):1. 22. Teo T. Factors influencing teachers’ intention to use technology: Model development and test. Comput Educ. 2011;57(4):2432-40. doi: 10.1016/j.compedu.2011.06.008. 23. Ajzen I. The theory of planned behavior. Organ Behav Hum Dec. 1991;50(2):179-211. doi: 10.1016/0749-5978(91)90020-t.
24. Venkatesh V, Morris MG, Davis GB, Davis FD. User acceptance of information technology: Toward a unified view. MIS Quart. 2003;27(3):425. doi: 10.2307/30036540. 25. Mehdipour Y, Ebrahimi S, Alipour J, Karimi A, Tabatabei F. [Determinants of physicians' technology acceptance for e-health in healthcare setting]. J Health Biomed Inf. 2016;3(2):92-9. Persian. 26. Kahrizsangi P, Rahimi Q, Zamani Nukabadi A. [A study of determinant factors of new information technology acceptance in sport and youth general office in Isfahan province based on TAM model]. Sport Manag. 2017;9(1):115-27. Persian. 27. Ajam AA, Badnava S, Sabery R, Zabihi Hesary NK. [Anticipation of e-learning acceptance through nursing student's enthusiasm scale at Gonabad University of Medical Sciences in 2015]. J Med Educ Dev. 2017;11(4):330-9. Persian. 28. Venkatesh V, Davis FD. A theoretical extension of the technology acceptance model: Four longitudinal field studies. Manag Sci. 2000;46(2):186-204. doi: 10.1287/mnsc.46.2.186.11926. 29. Bollen KA. Structural equations with latent variables. New York: John Wiley; 1989. 30. Doloi H, Iyer KC, Sawhney A. Structural equation model for assessing impacts of contractor's performance on project success. Int J Proj Manag. 2011;29(6):687-95. doi: 10.1016/j.ijproman.2010.05.007. 31. Singh R. Does my structural model represent the real phenomenon? : A review of the appropriate use of structural equation modelling (SEM) model fit indices. Market Rev. 2009;9(3):199-212. doi: 10.1362/146934709x467767. 32. Hair JF, Sarstedt M, Ringle CM, Mena JA. An assessment of the use of partial least squares structural equation modeling in marketing research. J Acad Market Sci. 2011;40(3):414-33. doi: 10.1007/s11747-011-0261-6. 33. 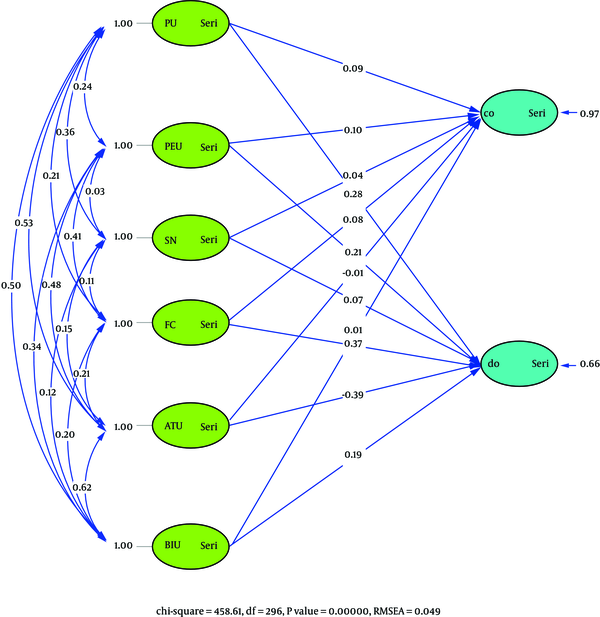 Bagozzi RP, Yi Y. Specification, evaluation, and interpretation of structural equation models. J Acad Market Sci. 2011;40(1):8-34. doi: 10.1007/s11747-011-0278-x. 34. Chinda T, Mohamed S. Structural equation model of construction safety culture. Eng Constr Archit Manag. 2008;15(2):114-31. doi: 10.1108/09699980810852655. 35. Marsh HW, Hau K, Grayson D. Goodness of fit in structural equation models. In: Maydeu-Olivares A, McArdle JJ, editors. Contemporary psychometrics. Mahwah, NJ, US: Lawrence Erlbaum Associates Pub; 2005. p. 275-340. 36. Hernández B, Jiménez J, Martín MJ. Extending the technology acceptance model to include the IT decision-maker: A study of business management software. Technovation. 2008;28(3):112-21. doi: 10.1016/j.technovation.2007.11.002. 37. Mastari Farahani F, Rezaei Sharif A, Ostadhasanloo H. [Obstacles of using information and communication technology in learning-teaching process]. Educ Strategy Med Sci. 2012;5(1):15-21. Persian. 38. Shoaei F, Alavi T. [The factors influencing technology acceptance among library users in technology faculties at Tehran's governmental universities]. Libr Inf Sci. 2007;10(3):9-34. Persian. 39. Mirasadollah Lajrod L, Alipour Darvish Z. [Organizational factors affecting knowledge sharing within group (case study: Offices of the Central Building of BSI)]. Educ Res J. 2014;1(29):62-78. Persian. 40. Gunawan S, Shieh CJ. A study on the effects of knowledge share in virtual community on creative teaching behaviors and teacher efficacy. Eurasia J Math Sci Tech Educ. 2016;12(4):1101-13. doi: 10.12973/eurasia.2016.1553a. 41. Zaqout F, Abbas M. Towards a model for understanding the influence of the factors that stimulate university students' engagement and performance in knowledge sharing. Libr Rev. 2012;61(5):345-61. doi: 10.1108/00242531211280478.